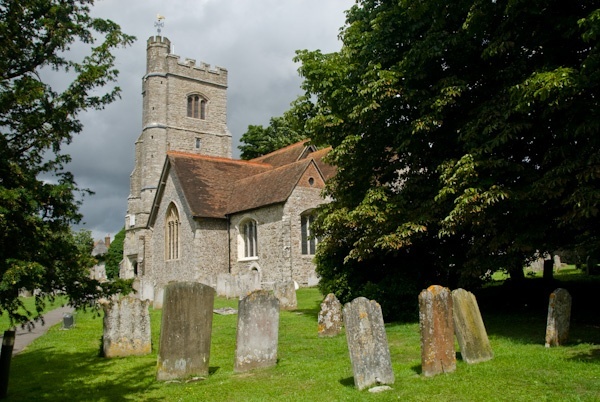 The attractive parish church of St Peter and St Paul in the village of Charing, Kent, is a lovely historic building with a nave and chancel dating to the early 13th century. Transepts were added in the following century, followed by the vestry. In the 15th century, the medieval timber tower was rebuilt in stone. The rebuilding took place in the last years of Edward IV's reign, as evidenced by wills of local people leaving bequests to pay for the work. One of these benefactors was the Brent family, whose arms appear on the tower stonework. In the late 15th century the Lady Chapel was built on the south side of the chancel by Hugh and Amy Brent, replacing an earlier chapel. It became known, not surprisingly, as the Brent Chantry, though it later passed to the Deering family. In 1590 a fire destroyed the roof and a large portion of the interior. 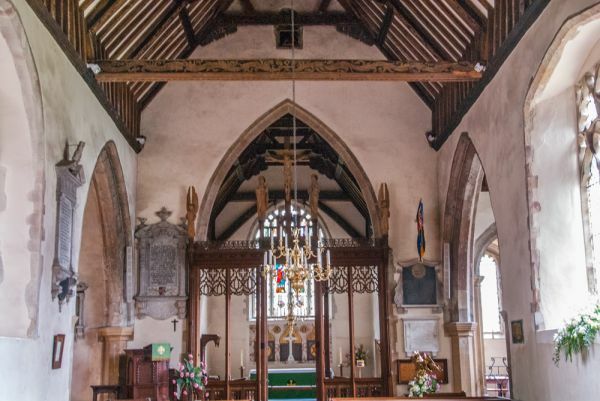 According to reports at the time, the fire was started when someone fired a gun at a pigeon on the roof of the church, which caused the roof timbers to catch fire. 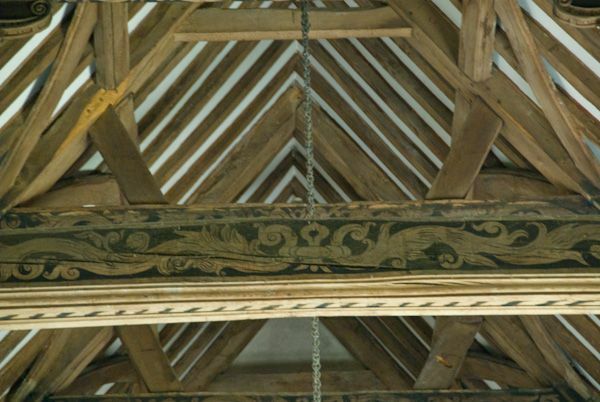 The nave was repaired by the parishioners by 1592, the date which can be seen on a painted beam near the chancel arch. 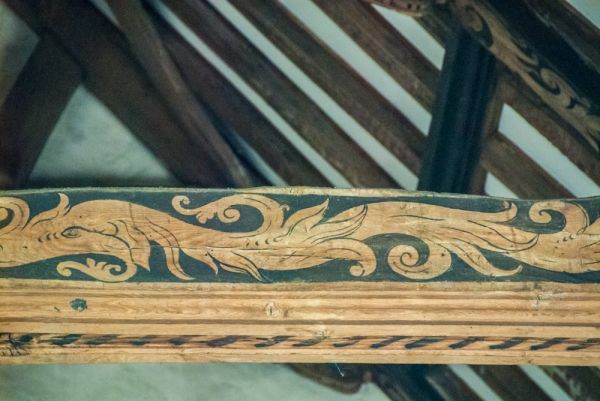 Interestingly, the person leasing the Rectory was responsible for repairing the chancel. Unlike the parishioners, it took him fully 30 years to fulfil his obligations! A chantry chapel owned by the Burleigh family burned down in the 1590 fire. 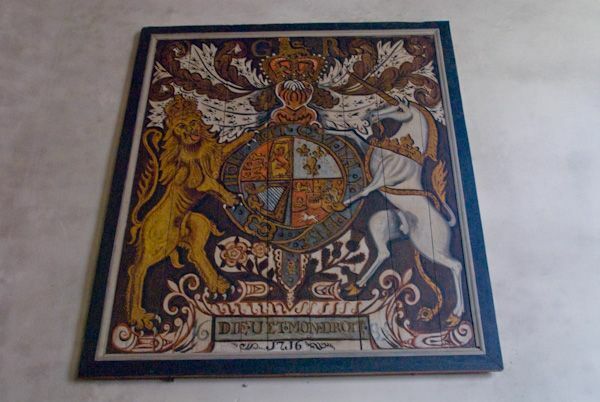 It was repaired by John Darell of Calehill, whose coat of arms was inscribed on the pews. In the chancel is a memorial to Samuel Belcher, who died in 1756. 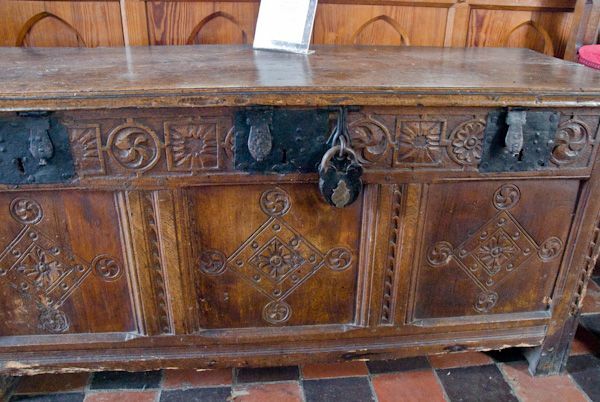 Within the church are some interesting wall memorials, a beautifully carved rood screen, a royal coat of arms dating to 1716, and an old wooden parish chest. 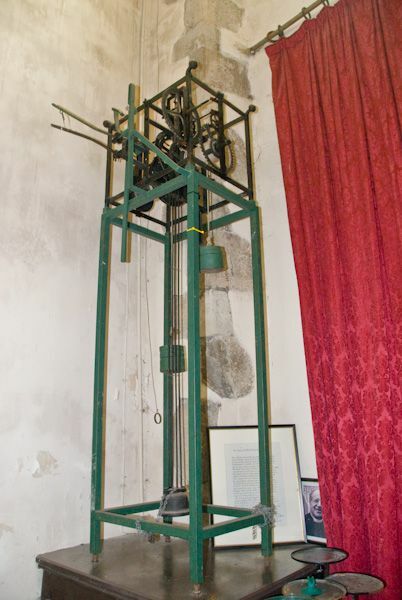 At the west end are the inner workings of the old church clock. The chancel boasts a 13th-century sedilia and piscina on the south wall. These appear to have been restored, probably in the 18th century. Between the chancel and the nave is an early 20th-century screen. The font dates to 1630. One unusual feature is a vamping horn, one of just 8 in England. The vamping horn was a form of 17th-century megaphone, invented in 1670 by Sir Samuel Moreland and used for communicating over great distances, for example, making public announcements or for military use at sea. Churches adapted vamping horns for choir use, but they fell out of popularity when organs were introduced into parish churches in the 19th century. In the churchyard are some very good 18th-century gravestones, including some bearing skull symbols. 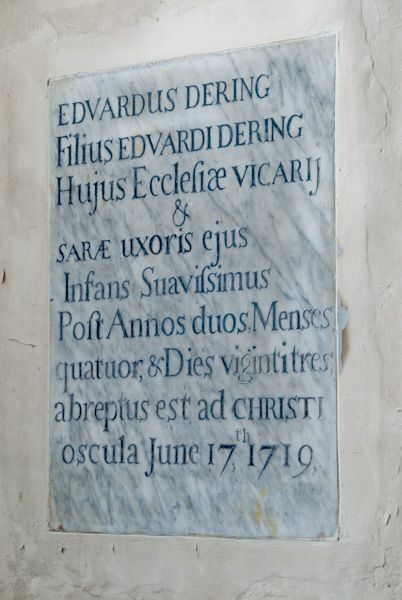 An 18th-century antiquarian, Edward Hasted, wrote that in the late 14th century the church possessed the block on which St John the Baptist was said to have been beheaded. What became of the block, which must have been an object of great veneration, is not recorded, though one modern source says that the stone was built into the church itself. Location: At the end of The Market Place, off the High Street.